UPDATE (Feb 23, 2012): We delivered a batch of petition signatures to the State Department in the USA -- you can read about it here. UPDATE (Feb 8, 2012 ,13:50 UTC): President Nasheed and his supporters held protests against the coup today, and we've just received reports that he has been arrested (and possibly released again, but injured) and many others have been injured and possibly 4 killed. 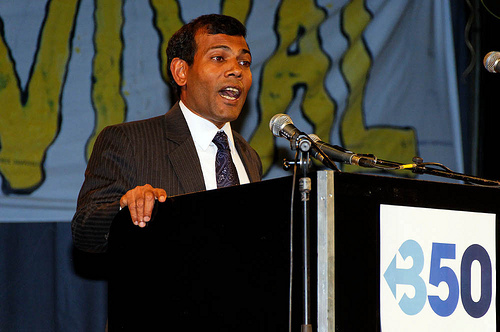 President Mohamed Nasheed of the Maldives has been one of 350.org's strongest allies, and friends, for many years. As the first democratically elected leader of the small island nation, he has been a tireless voice for climate action and strong advocate for getting us back to 350 ppm. "For us, this is a matter of life and death," Nasheed has said. Now it is he specifically who is at risk. A military coup forced President Nasheed from office on Tuesday morning with threats of violence. Sign the petition to the right to tell our national leaders that they must use diplomatic means to keep him safe in this time of turmoil. Assuring his, and his people's, safety is crucial. We are deeply concerned about the recent coup that forced Maldives President Mohamed Nasheed from office. President Nasheed was the first democratically elected leader of his country and a global voice for action to address the climate crisis. He needs your support to ensure his safety. Please put diplomatic pressure on the leaders of this coup to avoid violence and to work for a peaceful, democratic solution to their conflict. [%= add_commas(total.actions) %] people have taken action so far. Sign on and help reach our goal of [%= add_commas(goal) %]!